The British government have recently given planning approval to three more offshore wind farms in the Southeast. The Greater Gabbard (situated about 25 Km off the Suffolk coast) is said to be one of world's largest wind farms and is the first UK wind farm to be outside UK territorial waters. 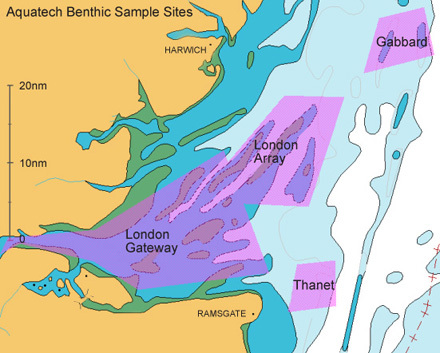 The London Array will be located in the Thames approaches (roughly 22 Km from the Kent coast and a similar distance offshore from Essex) and will be the world's biggest wind farm. The Thanet wind farm is to be built off North Foreland in the vicinity of the Drill Stone bank. Coincidently, through the middle of these and up the Thames estuary, planning is under consideration for a new container port. This is the London Gateway project. 'Aquatech' and 'Aquadynamic' were used to collect all the sediment samples needed for the environmental impact assessment surveys required for these four sites. This was probably one of the most challenging benthic sampling tasks around these shores in recent years. All of these sites feature strong tidal flows over shallow, sometimes drying, exposed banks. Sediment types ranged from fine sand to coarse, broken shell and cobbles. Sea state was often an issue over the banks, as was the risk of grounding. Each site was adjacent to high traffic areas and particular care was needed at all times. Many hundreds of samples were taken over several months using both our 'Day' grab and mini 'Hamon'. One of the sites also required high resolution sonar and seabed images to map the extent of adjacent areas of Sabellaria. We designed and built our first 'Weasel' camera system to cope with the poor underwater visibility and obtained some excellent results. This work was highly commended by both CEFAS and JNCC so we have gone on to develop two more camera systems. Our unique auto-hydraulic grabbing system and our purpose built camera enabled us to collect all the data needed from these very testing sites. The star performer, though, was our new vessel 'Aquadynamic' which coped admirably with a huge mileage in very tricky conditions at times. We still collect samples for the Gateway project on an annual basis.